There are a lot of stubborn people out there, people that claim that they paid $3000 for a good system 3 years ago and it's not economical to buy a new one. Those are the people that help slow sales of computers and computer parts =). Of course, there are a lot more of theses people out there than we think (i.e. baby boomers). Until they learn that computers are a technology that moves faster than light and keeping the same one for over a year and a half is suicide, they will stick to their old, run down computers, trying to squeeze more than enough life out of it and complain when the newest, greatest software and games run slow on it. Computers are a worthwhile investment for the most part but a power system meant to be the best at everything probably wont be the best in 3 months. You have got to love that about computers, they are machines with a limited life span but there are always the trusty old beasts you keep for a lifetime, be it the one you wrote your first program on or the first computer played DOOM with. These legacy machines are just sitting on the floor in the basement collecting dust (mine is). So what is there to do to make your machine more up to date? Surprisingly, a lot… upgrades can be made to almost every aspect of the machine including processor, ram, hard drive, cd-rom/dvd-rom/cd-rw, etc… that's the beauty of computers and standardized parts, you can upgrade them to you hearts desire. But what if you have an old Slot-1 system tat runs on the aged LX chipset? They cannot support the new, faster 100MHz and 133MHz Pentium's and they sure as heck can't support the FC-PGA Coppermines. That was the common consensus until we discovered a product from Evergreen Technologies, long known for their processor upgrade kits. Evergreen has made a processor kit that lets you upgrade that old Slot-1 66Mhz LX chipset computer (333Mhz maximum) into a 766Mhz Celeron processor (Coppermine). A great idea and a great potential increase in speed. Of course we had to check it out and we have had one in the labs for a while now and we were quite impressed with the speed of the new processor but how does it stack up in value and speed? 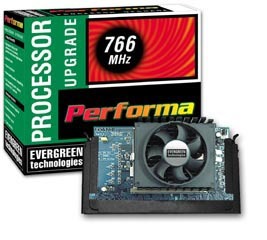 The Evergreen Performa kit comes with everything you need to upgrade your LX Slot-1 motherboard up to 766Mhz. It is supposed to be an automatic upgrade as in your BIOS should recognize it as it's own chip and everything will instantly be sped up. Plug and play installation can be applied to this chip upgrade.